Three-time World Equestrian Games silver medalist and 13-time U.S. Four-in-Hand National Combined Driving Champion, Florida’s native son, Chester Weber, was born and raised surrounded by horses at his family’s Live Oak Plantation, nestled amidst the towering oaks and rolling green hills of Ocala. Raised by a family with deep roots in the equine industry, Weber was destined for a future with horses. Though he first dreamed of being a jockey, a logical choice since his family bred and owned racehorses, he soon outgrew that dream. “I initially wanted to be a jockey but at 6’2” and 190 pounds? Those guys weigh 120 pounds soaking wet,” Weber remarks. Weber began driving by working with Clydesdales before moving onto the Four-in-Hand, which he describes as the Formula I of driving. 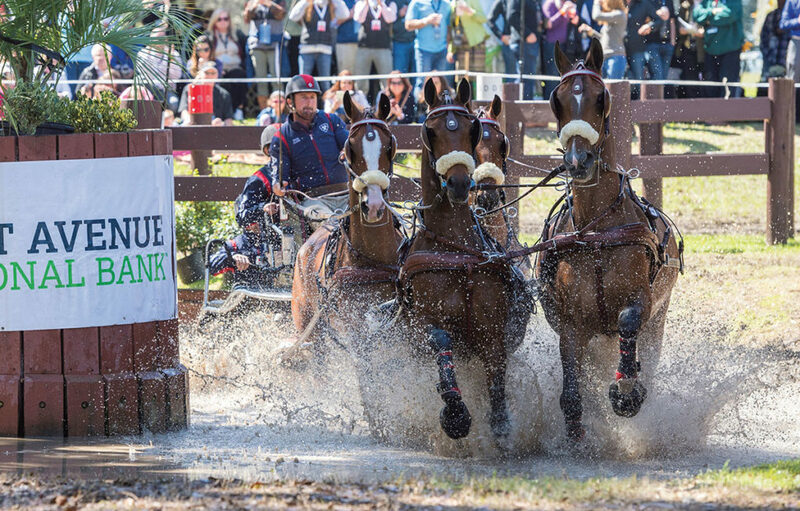 Four-in-hand combined driving refers to a four-horse drawn carriage driven by a single driver competing in three unique phases: dressage, cross-country marathon and the obstacle cone competition. Scores and times from each phase are added together and converted into penalty points to come up with the final score. The team with the lowest score wins. After an auspicious win at Little Everglades in January, Team Weber has their sights set on the Live Oak International. “Our focus is now on the national championship at Live Oak International in March. We had a pretty commanding lead at our last competition, so we are feeling particularly bullish going into Live Oak,” says Weber. The 2017 Live Oak International, which takes place at the 5,000-acre equestrian estate owned by the Weber family, is March 9-12. It is the largest equestrian competition in the U.S. to feature both jumping and driving. For news on Team Weber’s latest achievements, upcoming events, and new horse additions, visit Team Weber on and @ChesterWeber, or visit ChesterWeber.com. For information about attending Live Oak International, visit LiveOakInternational.com.